SAN DIEGO - National Football League owners Tuesday approved a stadium project in Inglewood for the St. Louis Rams, with the Chargers being given an option to move there if the team cannot reach a viable stadium deal in San Diego. The decision opens the door for the city and county of San Diego to reopen negotiations with the Chargers to keep them from moving, while giving the team a safety net if such talks break down again. According to reports from the NFL owners meeting in Houston, where the 30-2 vote was cast, the Chargers and Rams could receive an extra $100 million from the NFL to build stadiums in their home markets, on top of the $200 million the league already offers for such projects. Earlier, a proposal by Chargers owner Dean Spanos and Raiders owner Mark Davis to build a facility in Carson failed to garner enough votes for approval. Before the vote took place, final pitches were made for each project, with Disney CEO Bob Iger joining Spanos and Davis to push the Carson proposal. "Dean Spanos, Mark Davis and I spoke of our passion in bringing the NFL back to Los Angeles, talked about the wonderful attributes of the Carson project, and spoke from our hearts," Iger told Chargers.com. "I think our comments resonated." It turned out not to be enough, as a proposal to have the Rams and a second team play in Inglewood, on land Rams owner Stan Kroenke controls at the old Hollywood Park racetrack, received more votes. Negotiations ensued to select the second team, and under what conditions they would move to the facility, which will take a few years to construct. "I have the entire year to make a decision if I want," Spanos told The Mighty 1090. "Like I said, I really want to get some sense of direction in the next month or so. But I don't have to do anything. I'm gonna wait and see." Spanos has wanted a replacement for San Diego's aging Qualcomm Stadium for around 15 years, a quest stymied thus far by the city's fiscal problems of a decade ago, the recession and difficulty in finding a suitable site. When Kroenke about a year ago proposed building the Inglewood stadium, the Chargers and Raiders responded by announcing plans to construct the Carson facility. The Chargers, who have played in San Diego for 55 years, contend that 25 percent of their business comes from Los Angeles, Orange County and the Inland Empire. Mayor Kevin Faulconer established a task force that has recommended building a new facility next to Qualcomm Stadium, but the Chargers broke off negotiations on the proposal last June. The team's refusal to restart talks prevented what could have been a citywide vote on the proposal this month. On Saturday, NFL Commissioner Roger Goodell distributed a report to owners that said plans by San Diego, Oakland and St. Louis are "unsatisfactory and inadequate." Among other things, the league objects to uncertainty created by San Diego's demand that plans for a stadium project be put before voters -- something the Chargers once supported. Chris Melvin, an attorney and lead negotiator for the city and county of San Diego, said Sunday that the Chargers created their own uncertainty. "We could have already gained voter approval of a stadium under the plan laid out this summer by the city and county," Melvin said. 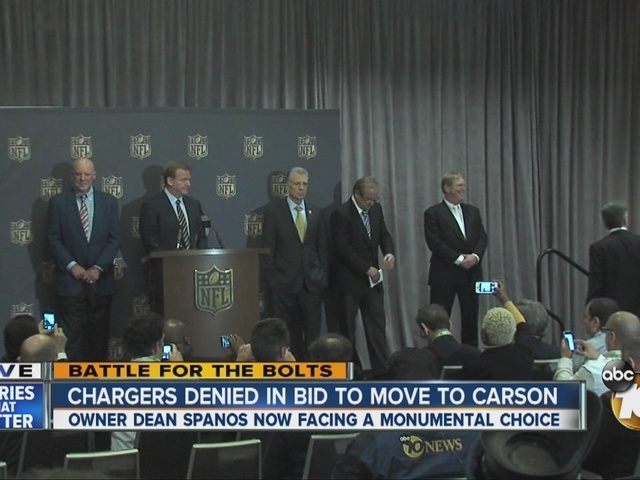 "But the Chargers stonewalled, rebuffed attempts to negotiate a term sheet, and refused to act. 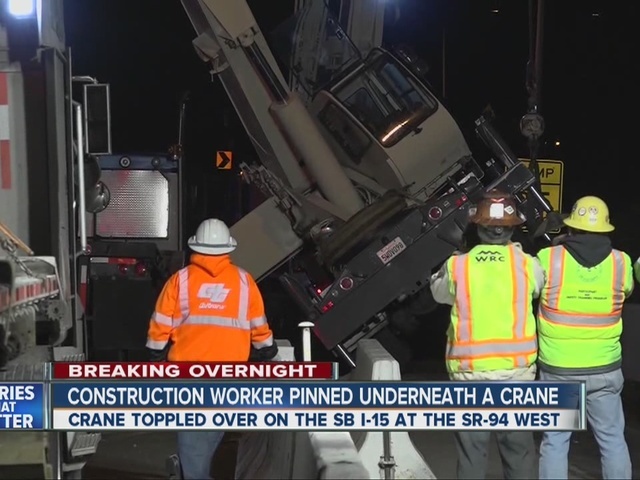 Despite all this, San Diego has proven that it's a region that supports its major league teams." "Today NFL owners rejected the Chargers’ bid to move to Carson. If Mr. Spanos has a sincere interest in reaching a fair agreement in San Diego, we remain committed to negotiating in good faith. We are not interested in a charade by the Chargers if they continue to pursue Los Angeles,” Mayor Kevin Faulconer said in a joint statement with County Supervisor Chairman Ron Roberts. 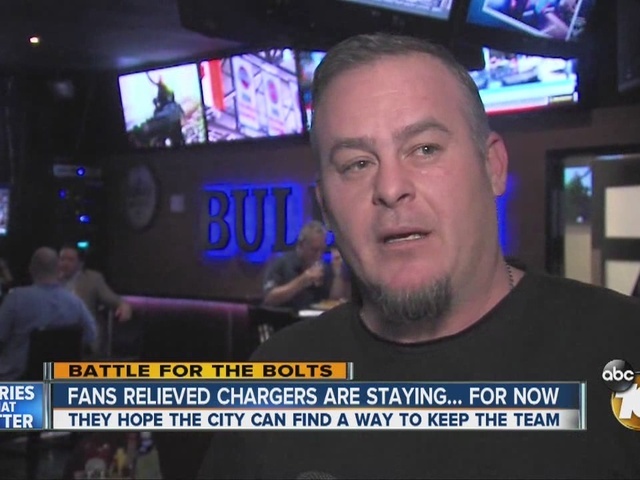 As the owners deliberated how to facilitate a move to Los Angeles, a handful of Raiders fans gathered outside their hotel in Houston -- along with one Chargers fan who traveled from La Jolla. 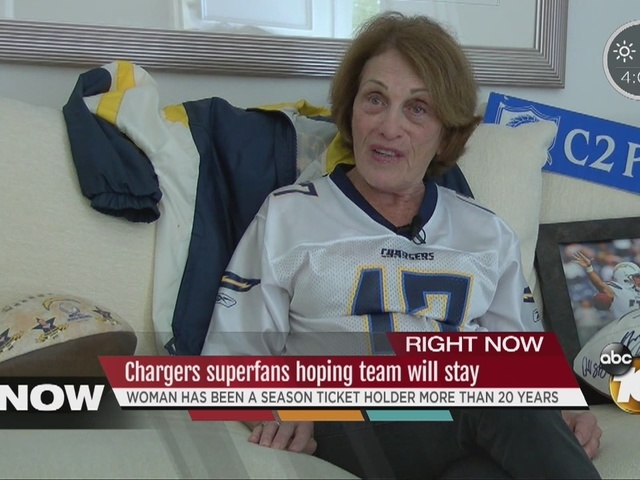 Richard Farley told 10News it would hurt if the Chargers were given the go-ahead to move after a 55-year stay in San Diego. "It would be like a shot to the heart," Farley said. "As far as going up to Carson, I would probably stop being a fan. It just would not be the same."